These instructions are for right-handers. Click here if you are left-handed, to see the images in reverse. 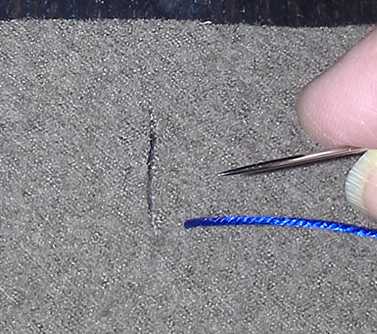 Cut a straight slit through the fabric to the intended width of the final buttonhole. 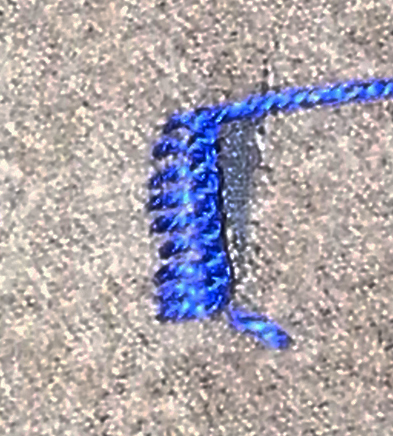 Draw your knotted floss up through the fabric from the bottom side to the top, about 1/4 inch away from the slit, directly even with one end of the slit. 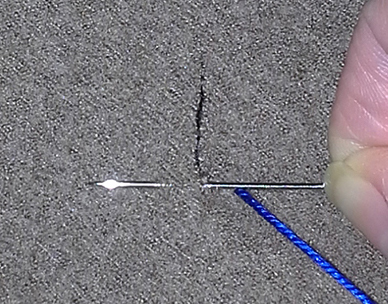 Insert your needle through the slit and stitch from the bottom to the top in the same location on the other side of the slit. 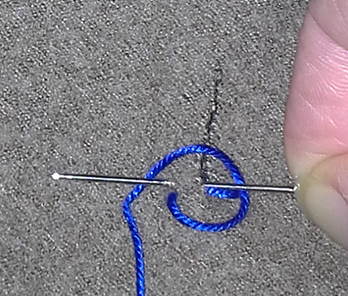 Lay the thread in a spiral so that your needle can pass through the slit and stitch up from the bottom as follows. 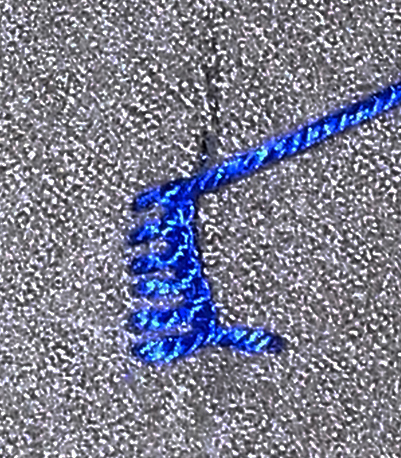 Draw the thread taut until a knot forms on the edge of the slit. 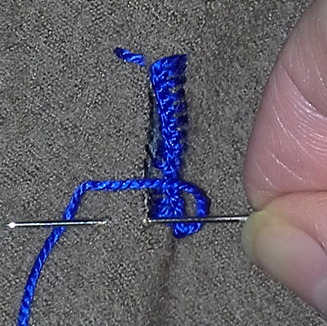 Repeat this knotting technique again, placing your next stitch directly next to the one just completed. Note: you may need to draw the needle up a little further beyond the end of the previous stitch so that when this current stitch is completed, it is the same length. 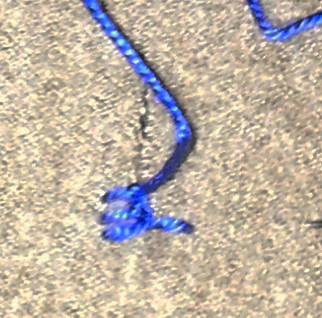 Some shrinking will occur when the thread is pulled tight. 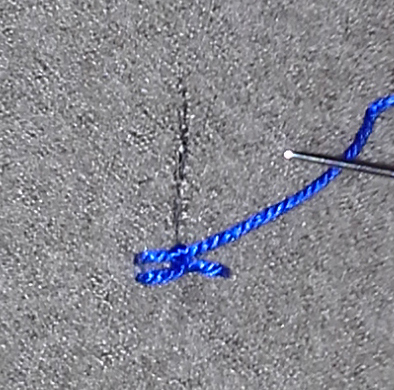 Continue this stitching and knotting technique, known as buttonhole stitch, down the slit along one side. Notice the pattern of the knots that emerges. When you reach the end of one side, turn the fabric around so that the finished side in on the opposite side it was on, and begin to sew the new side using the same knotting technique. Work your way up the second side of the slit as you did the first side. When you reach the end of the second side, you will need to anchor your thread to the existing first stitch which was made when you began. 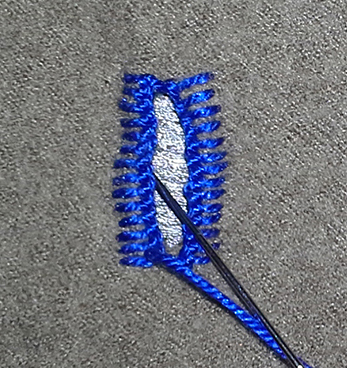 In addition, you will need to anchor the thread to the row of stitches on the other side. This will provide some strength against strain and button friction. Turn your fabric around again so that the end with the needle and thread is closer to you. Insert your needle under the first stitch from the outside inward, and then slip it under the first knot on the right side of stitches. The thread is now ready to be finished off. Tuck the needle through the slit from the top to underneath. Turn the fabric over to look at the back side of the buttonhole. 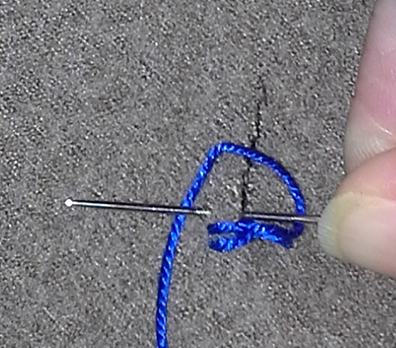 Insert your needle underneath the stitches on one side of the opening, drawing your thread through. When the thread has been drawn through from one side of a row of stitching to the other, you may wish to continue this process on the other line of stitching. This is another way to strengthen the edge of the opening. 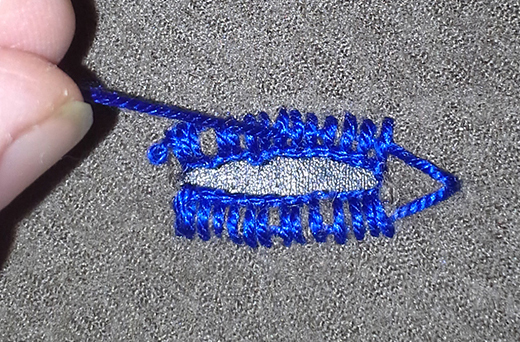 When finished, it is your choice whether to cut the thread (no need for a knot), or to run the thread up to the next opening to start sewing another buttonhole. Turn the fabric over and admire your lovely medieval buttonhole. Note that the buttonhole is rectangular in its finished form. The more you practice, the faster you will get. I can sew a buttonhole in about 3–4 minutes. I don’t want to count how many hundreds of them I had to labor over to get to that time. Thank you for such a lovely site and for all the wonderful information. 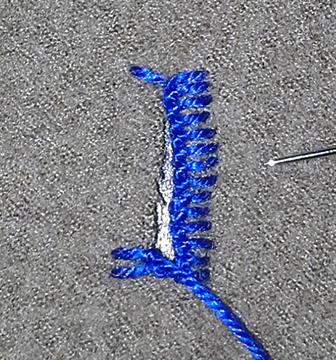 First, wouldn’t you finish with a buttonhole stitch at ends to prevent raveling? I embroider and am getting ready to make some 14th century garb for the first time. Second, I read that backing the button hole area with twill woven silk makes its stronger and is period. I’ve got the the silk and am planning on backing the buttonhole area with it. 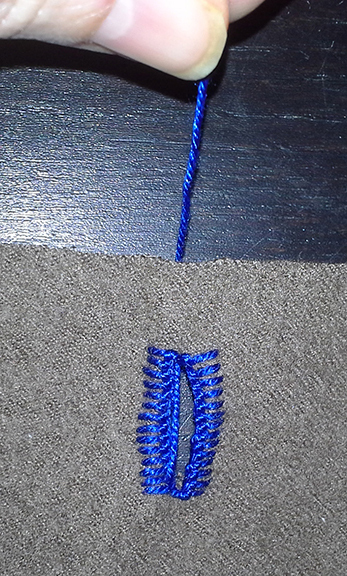 How difficult is it sewing the two layers — it’ll be linen and silk — in the buttonhole stitch? 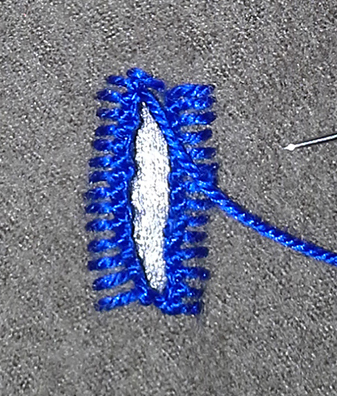 Finally, I’ wondered about using a small hoop or a rectangular on sewing these buttonhole stitches? 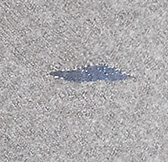 I’ve discovered that it helps control linen fraying on edge work, even when the edge is not super taut. Glad the site has been useful! Effectively, I do finish with a buttonhole stitch, and then thread the floss through the stitches on the back side to hide it, and give that last stitch some staying power. Each type of fabric will fray a different way when snipped, naturally, so the best thing you can do to prepare yourself for the challenges your two fabrics will present is to take small patches of each, lay them together, and sew a buttonhole to test it out. With fabric that frays a lot, the challenge will be to get the stitches close enough together to wrangle the frayed bits down and out of sight. You could always cheat and use Fray Check, if it’s really problematic. The rationale would be that once the buttonholes are finished, there’d be no visible sign of the Fray Check. I suppose you could also use a little soft beeswax too, though I’ve never tried that — just brainstorming. Regarding the hoop, definitely try it and let me know how it goes for you. I have no issues holding the loose fabric for this sort of work, but then again, maybe it would be even easier if I tried a hoop! Your buttonhole stitches aren’t packed tight. Is that the way it s/be when finished or the way you did it so we could see your stitches? It. Looks very neat and tidy. TY for the tute! The extant examples I’ve seen aren’t packed much tighter and in some cases are a little looser, so it’s really up to you how close you want to make them to each other. 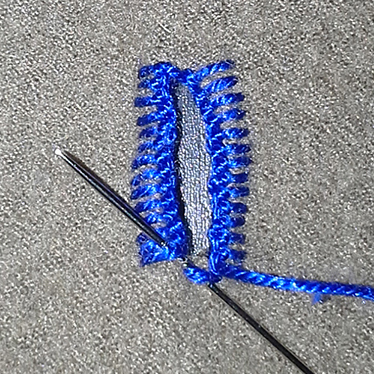 The thickness of the floss used can also affect the appearance and save you some stitches, though there is a point where it gets too thick and the buttonhole becomes an ugly blob. The photos show how I do buttonholes myself most of the time. 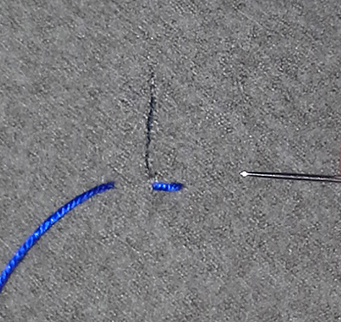 It’s a common mistake to make buttonholes with stitches too close together (re the earlier comment). 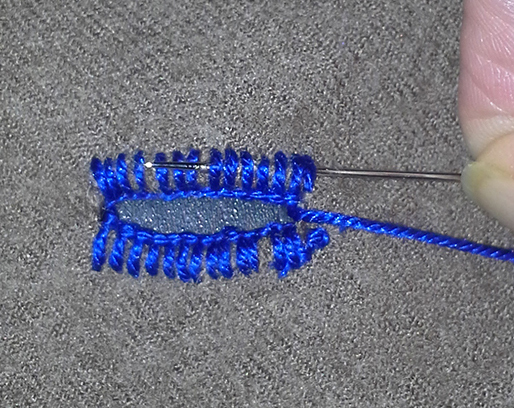 There needs to be room for the knot formed at the top of the buttonhole stitch to lie flat against the edge. Too close together and they start overlapping and buckling upwards. 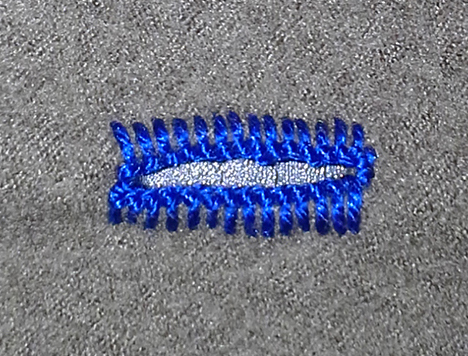 Machine stitches need to be close together as the zigzag more replicates satin stitch and they need to be close to protect the edge. Stitches should be well placed however in order to look neat and tidy and to effectively edge the frayed hole in the fabric. I think the example here, shown on a tough fabric looks nice. Thanks for the observation, Becky. Buttonholes are indeed a “Goldilocks” scenario, where you can get them too sloppy, too tight, or just right.